Christmas is for gifts, but those of us in the foodie blog world get a gift every week. What gift is that? Why it’s What I Ate Wednesday…the gift that keeps on giving. It is the gift to us all from the lovely and talented Jenn over at Peas & Crayons. It is such a fun thing and we all get to participate. Those of us who do participate, hope that all of you will go check out the links at Jenn’s blog and read up, leave some comments, drool at all the shared goodies. After the Christmas Eve free for all, I was trying to be somewhat under control on Christmas day itself. We slept in a bit and said no to breakfast out with sister, Ele and our friend Jim. 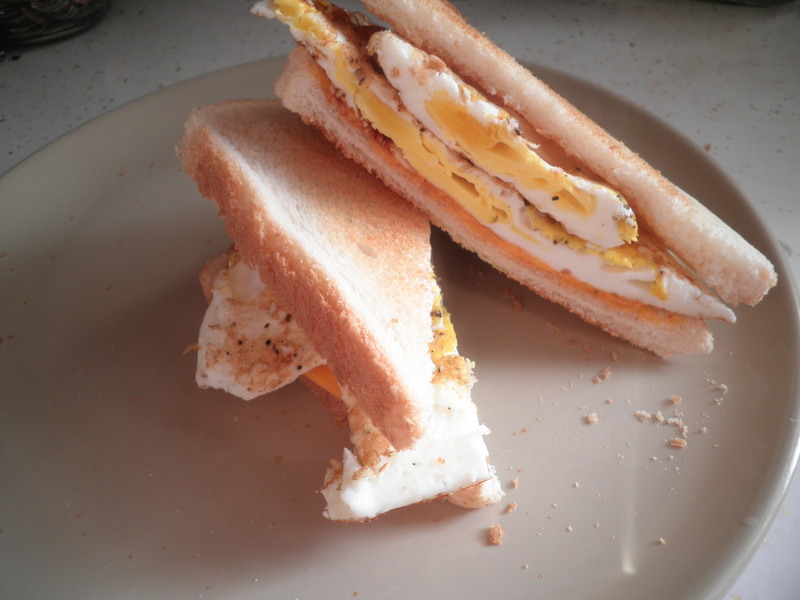 I whipped up bacon and eggs for Ralph and made myself a yummy egg sandwich. I’m not a fan of white bread, but that was all we had. 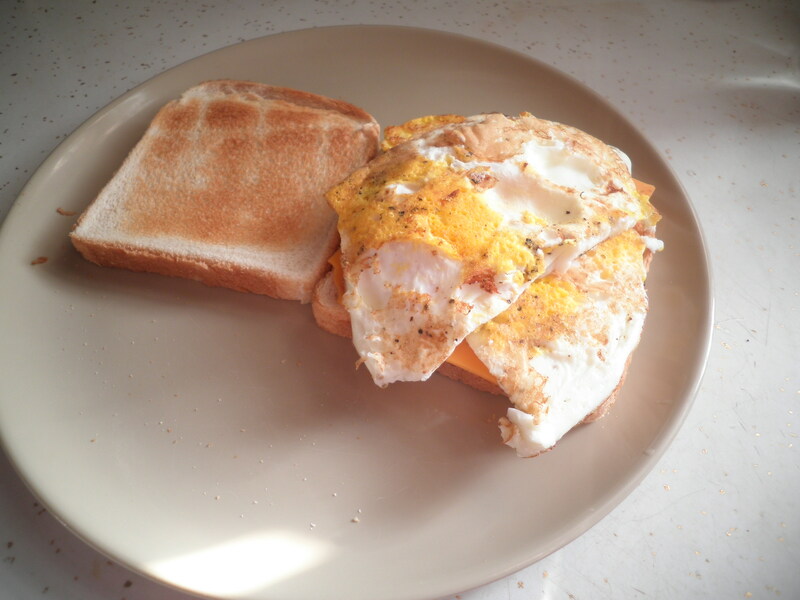 The addition of buffalo pepper cheese certainly amped up the taste. Very Good. For the last few Christmases, since there are fewer of us than there used to be, we’re down to 4, we have been spending Christmas recreating the Chinese restaurant scene from “A Christmas Story.” There is a wonderful restaurant called Sakana Oriental not far from where we live. We like it for a lot of reasons. It’s usually quiet there on Christmas and we get all of the attention! 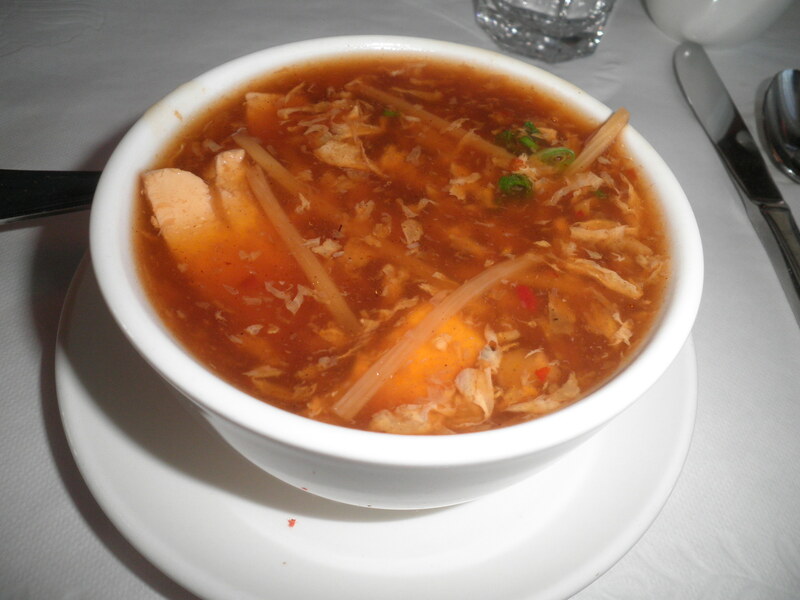 I started with hot and sour soup. This is one of the reason why I like this restaurant so much. Their hot and sour soup is vegetarian and it is delicious. My main course is something that I requested and fortunately, they complied. I love their tofu family style which is tofu with lots of veggies. 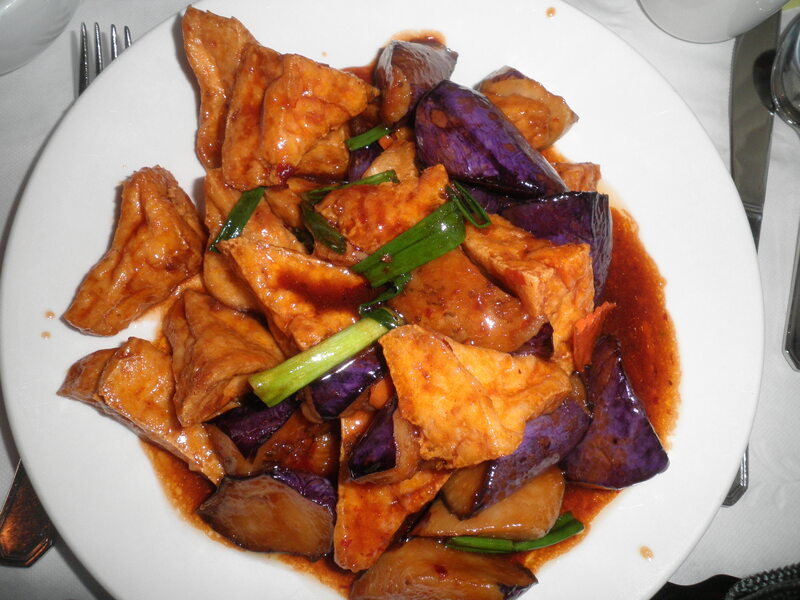 I also love their Chinese eggplant in garlic sauce. 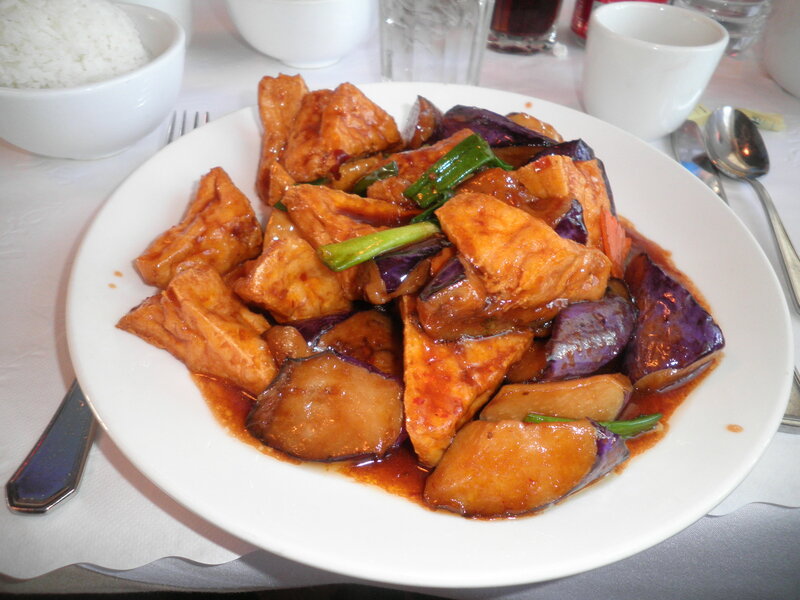 I asked if the tofu could be combined with the eggplant. Thankfully the answer was Yes! It was absolutely delicious! It will be my go to choice from now on when we visit there! There were lots of dessert choices at Ele’s house so we declined dessert at the restaurant. 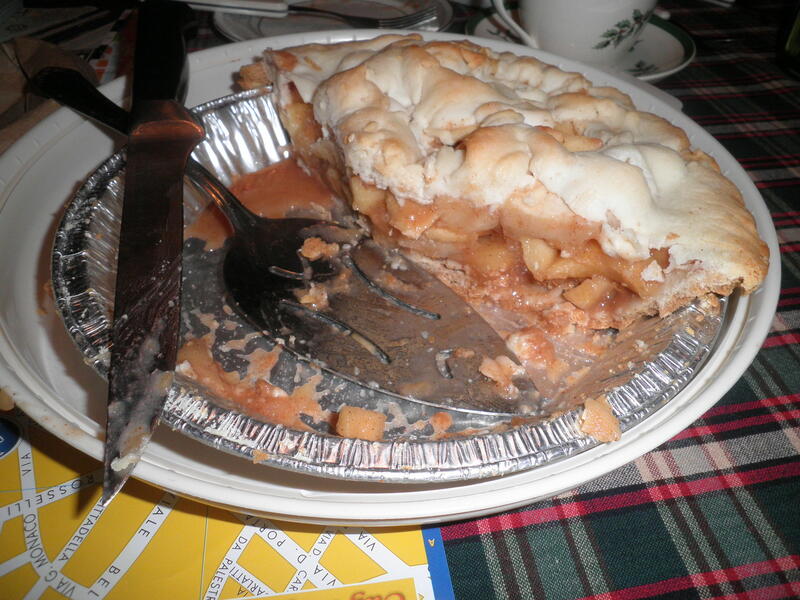 Apple pie, home-made by our friend Jim. It is SO good! Almost finished. 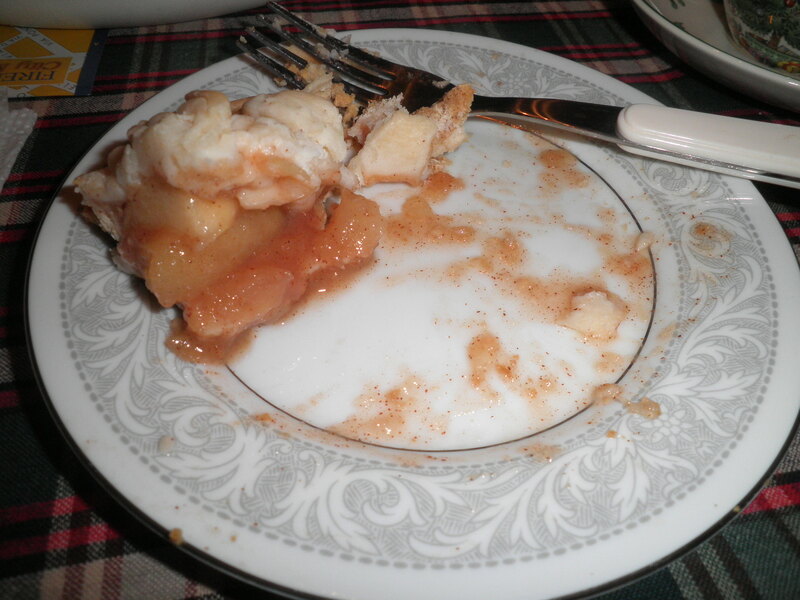 You can believe that not a bit of this was left on the plate! 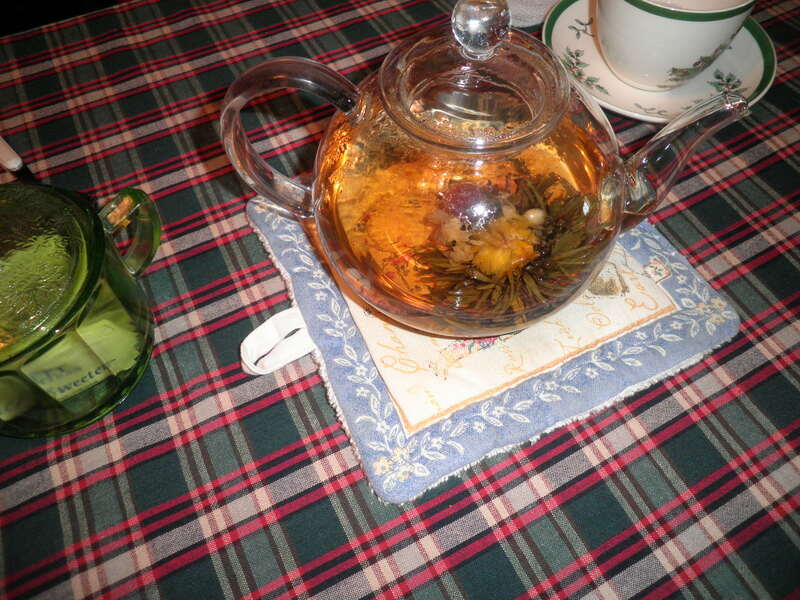 A fun gift that Ele got for Christmas was this glass teapot accompanied by the tea flower balls which bloom when you add the hot water. It was a very mild flavor and I usually like a stronger tea. But it surely was pretty! We had a wonderful Christmas Day in all possible ways including the food. I’m proud of myself that I was as in control as I was. I do feel like I’m still trying to get back into control. A few days this week in control and then 2 more days of Holiday challenges next weekend. But I feel I’m up for the challenge. So that, dear Friends is What I Ate Wednesday-The Merry Christmas Edition. Please be sure to do yourself a favor~take some time to stroll around Peas & Crayons and enjoy all of the wonderful food that is sure to be found there. It’s pretty intense on a regular Wednesday. I’m sure I’m not the only one sharing my Christmas fun, so I’m sure there’s plenty to enjoy. It’ll be my gift to You!